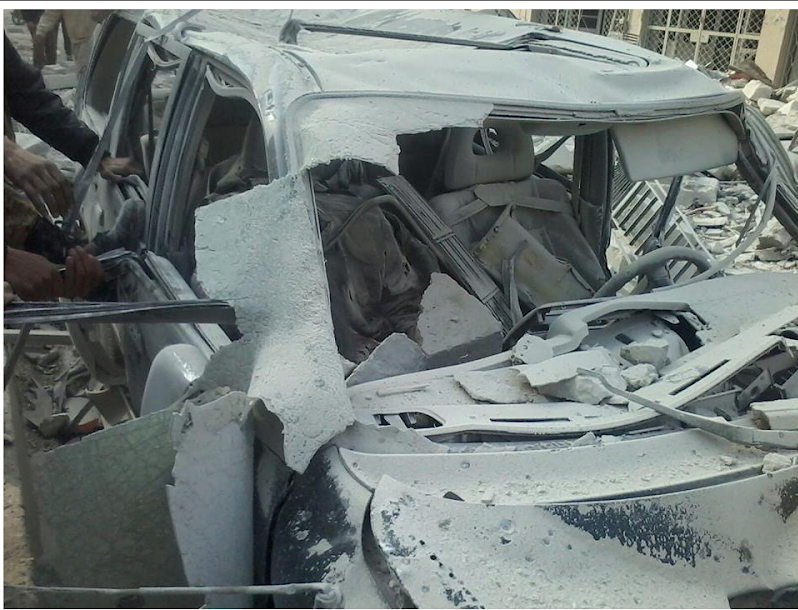 A major civilian casualty incident allegedly took place at an IDP camp near Jadid Akeidat, Eastern Deir Ezzor countryside. 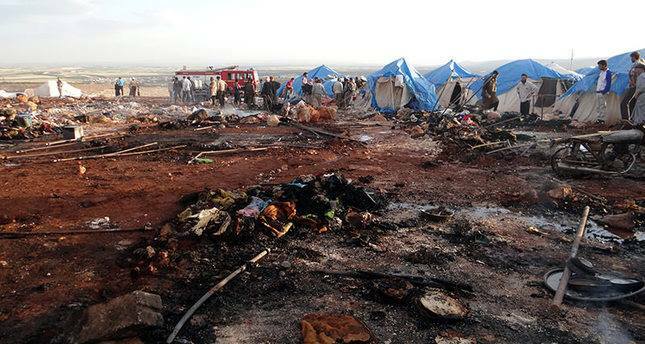 Al Yaqeen reported about 100 displaced people were killed, mostly women and children, following an alleged aerial bombardment by the US-led Coalition at the camp (pictured). However this was contested – with Euphrates Post asserting that this news was in fact propaganda put out by the so-called Islamic State organization. 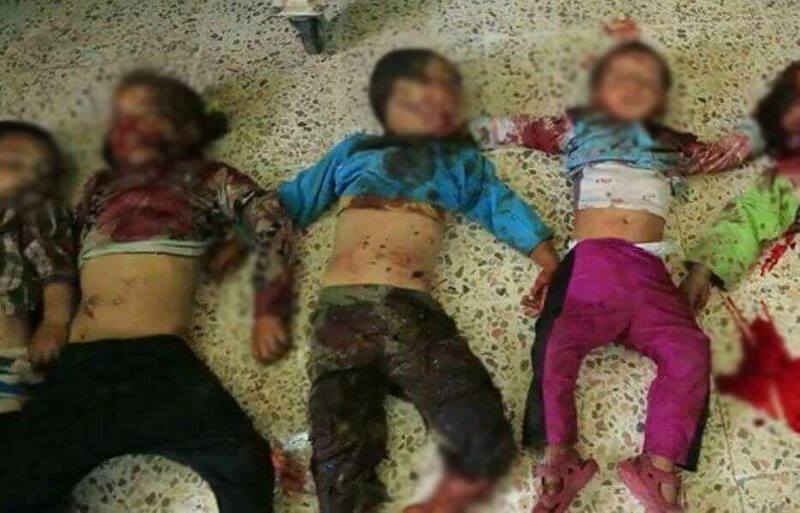 Activists quoted in the Syrian Mirror described a “massacre of about 120 civilians, including 100 children”, the death tolls were reiterated by Jisrtv – both blamed the US-led Coalition. 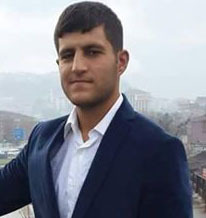 Activists shared concern “about the increase in the number due to the injuries of varying degrees of danger, in light of the weakness of medical services and the shortage of medicines and medical staff” with Shaam News, they also posted pictures which showed the wounded and “significant physical destruction in the targeted area’”. 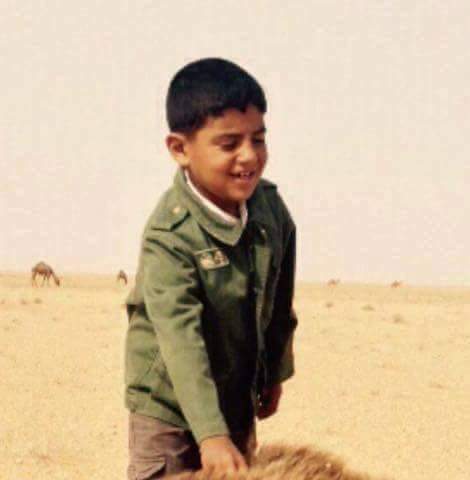 According to Shaam “Al-Assad and his Russian ally planes fly with the International Coalition aircraft to bomb areas under the control of the Islamic State in Deir al-Ghazal countryside, which are full of civilians. None of the planes have taken any notice of the lives of children, women and the elderly”. Sadaalsham News did not identify a culprit, and referred only to “unknown military aircraft”, however it cited Step News Agency which quoted a source “close to Daesh”, which attributed blame to the US-led Coalition. @abazeid89 blamed both the US-led Coalition and Russia for the massacre, and posted a graphic photograph of a girl bloodied following the raid. RFS Media Office said Moscow was responsible, asserting that “Russian warplanes” carried out the “horrific massacre” on the IDP camps in Deir Ezzor city’s countryside. 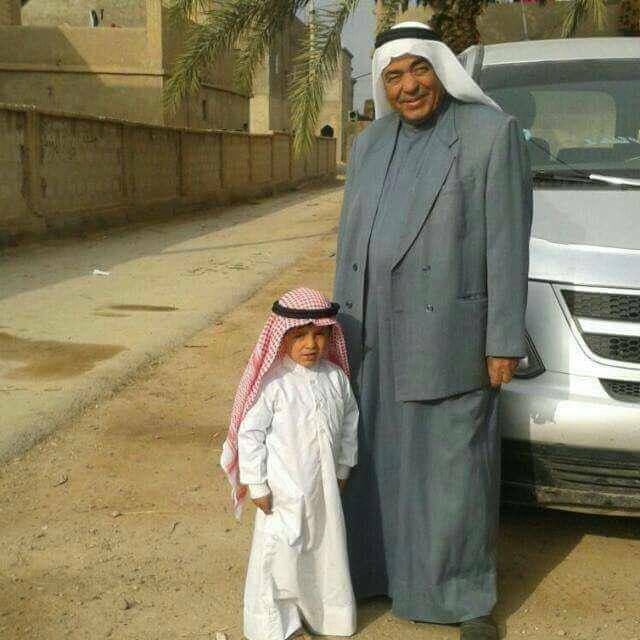 Two named children were killed in the town of Khasham, according to Euphrates Post, and reported by al a’amaq as having been killed in the alleged Jadid Akeidate camp. For September 14th-15th: “Near Dayr Az Zawr, two strikes engaged two ISIS tactical units and destroyed two vehicles", and "On Sept. 14, near Dayr Az Zawr, Syria six strikes destroyed an ISIS UAS, a fighting position, an ISIS supply route and suppressed three fighting positions"
One source reported that 109 civilians were killed by Russian or Syrian regime warplanes in Al Atarib, Aleppo. One other source reported that there was shelling due to Syrian regime warplanes which wounded civilians and destroyed building. There are no other sources at this time. Russia has not reported any specific strikes between December 1st – 31st 2016. In a major civilian casualty incident widely reported as a sarin gas attack, between 20 and 102 civilians, including women and between five and 28 children, were killed and between 100 to 500 civilians were injured in airstrikes against the village of Akeirbat in the eastern suburb of Hama, according to local media. 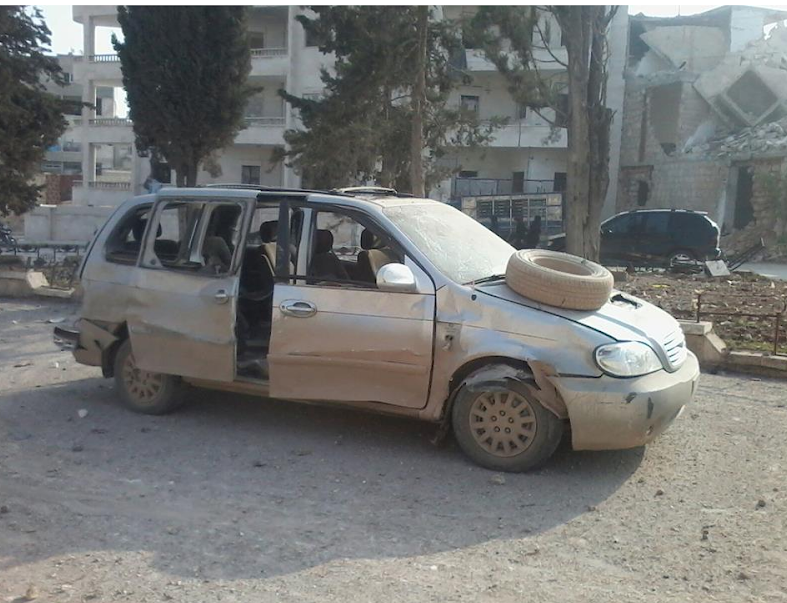 Sources were conflicted as to whether Russian or regime planes were responsible for the airstrikes. According to local media, more than 20 airstrikes carrying both bombs and sarin gas targeted civilians in Akeirbat, which was said to have been under the control of the Islamic State at the time. 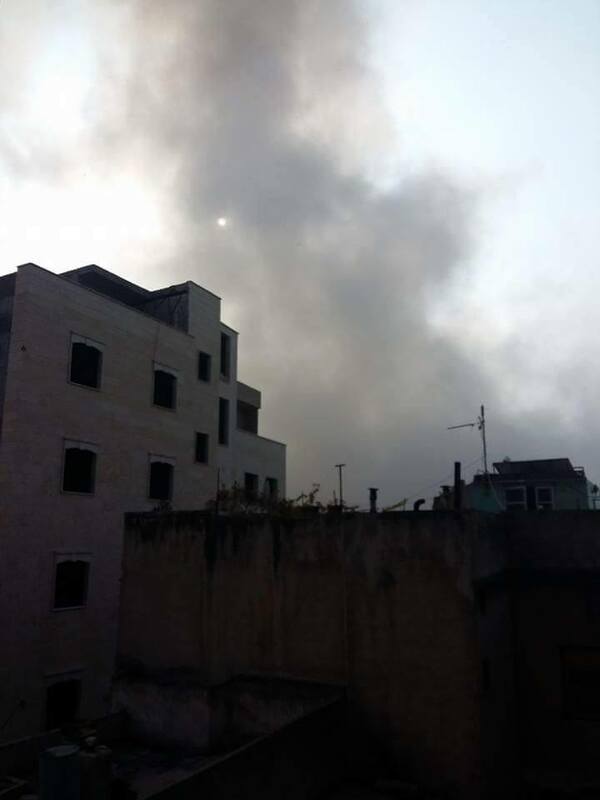 The raids focused on the residential areas of Aquirbat, Nuaimiyah, Al Qstil, Al Hanouta, and Alsaliya, which were heavily occupied with refugees who had fled violence in other cities. 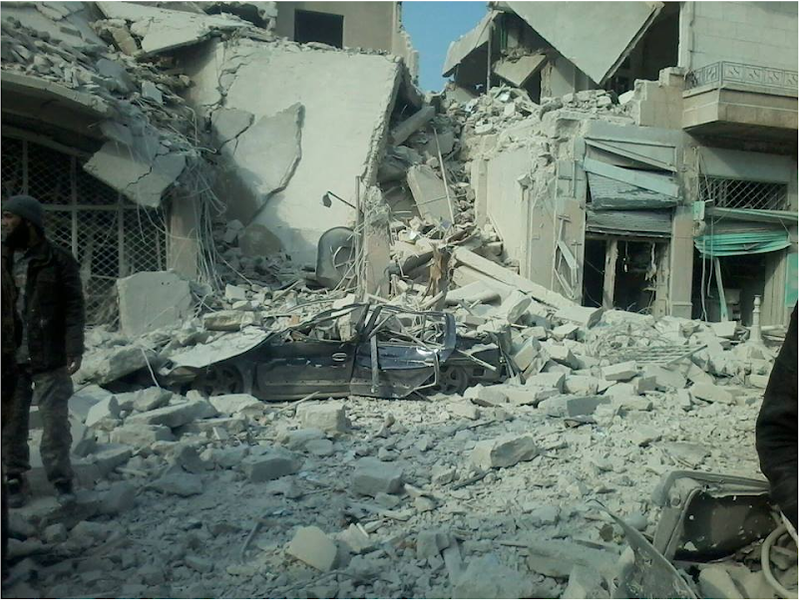 The area of Akeirbat had been repeatedly bombed as part of a campaign against the city of Palmyra in Homs – and was facing a media blackout at the time. There was no consensus among reporters of who who was responsible for the chemical bombing, with reports equally split between Russian and regime blame. Many local sources, including Syria News Desk and Zaman Al Wasl, identified regime planes as the culprit while various other sources, including Al A’maq and Smart News, blamed Russian planes for the airstrikes. 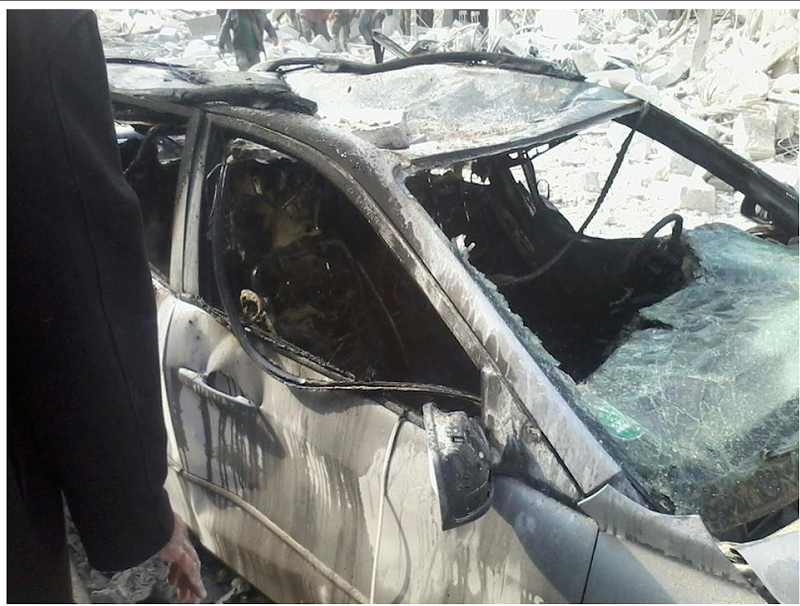 Other sources, such as the Syrian Observatory for Human Rights, did not identify who was responsible for the bombing while others, such as Alarabiya, specifically pointed out that it did not know if the planes belonged to Russia or the regime. Victims of the sarin gas attack were treated at local hospitals for fainting, suffocation, nausea, involuntary urination, paralysis, and eye swelling. Most victims reportedly had no signs of physical injuries or blood, offering evidence for a toxic gas attack. Local medics claimed that the gas had no colour or smell, which distinguishes it from chlorine. 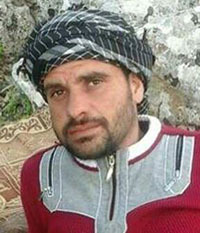 Media activist Ahmed Al-Hamwi told Syria News Desk that entire families were among those killed in the airstrikes. Many of those killed had hidden in trenches before they knew that toxic gas was being dropped, which is heavier than air and therefore suffocated those in the trenches. The London-based Guardian also reported on this event. It’s report said: “Up to 300 people were also reported to have been injured in the strikes on Monday morning around 130 miles west of the city of Palmyra, which was retaken from Syrian forces by the Islamic State group. Witnesses to the attacks say that none of those who died had blast injuries. @AleppoAMC said that up to 500 people had suffered from “suffocation”. 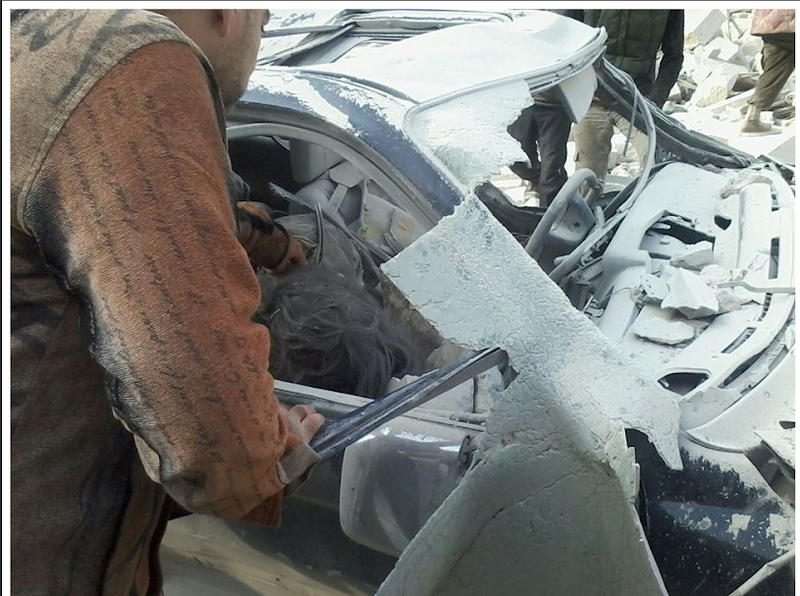 The incident occured at approximately 12:00 pm local time. 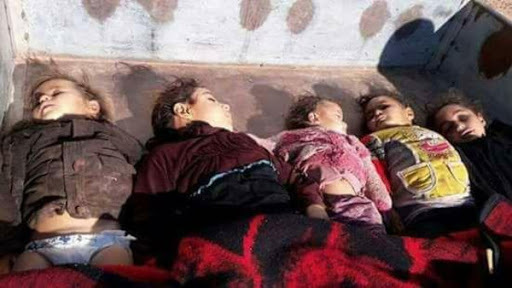 Between 52 and 96 civilians including three women and one child were killed and more than 200 injured in Russian airstrikes on Maarat al Numan, according to multiple sources. 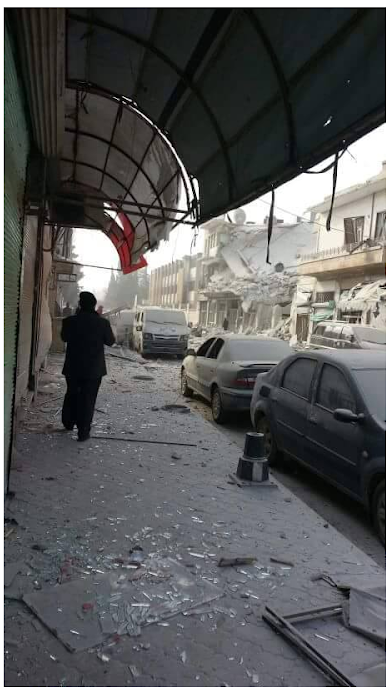 The Shaam News Network initially reported that more than 20 civilians were killed and dozens wounded (mostly women and children) when Russian warplanes struck different districts of the city with “highly explosive missiles“, targeting civilian homes, a popular market place and the Justice Palace. The death toll climbed in subsequent reports, finally reaching over 90 with more than 200 wounded “thronging field hospitals in the region“. They stated that body parts were scattered all over the area. 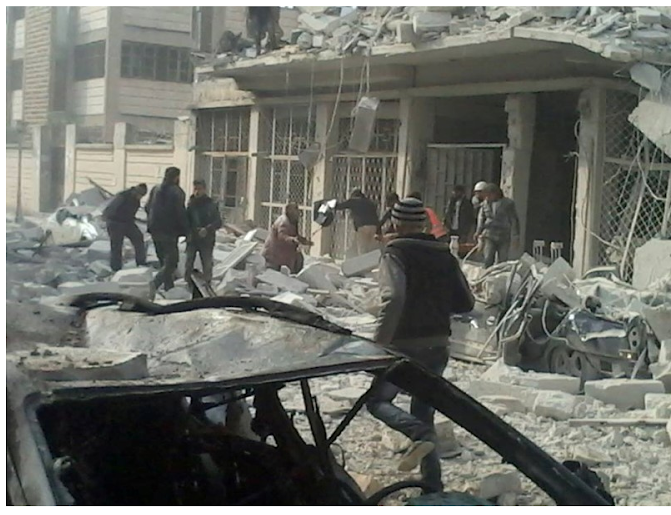 Activists told SNN that Russian aircraft also targeted a courthouse and prison belonging to the Al-Nusra Front, resulting in massive destruction and the deaths of all who were at the site or around it. 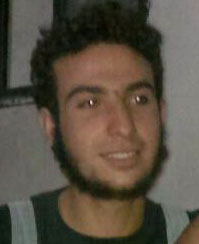 They said that the majority of those killed were prisoners who were being held on multiple charges including belonging to the FSA. A medical source added that masked members of the Al-Nusra Front raided a field hospital in the region to arrest some of the injured. But two other reports said more people had died, with the figure finally rising to 81, including 52 civilian citizens and prisoners (including three women and a child), 23 fighters from Jabhat Al-Nusra (al-Qaeda in the Levant) and six fighters from other rebel and Islamic factions. According to the Syrian Observatory, Russia used four missiles on the Administrative Court of Jabhat Al-Nusra which included a prison, in addition to targeting areas in the vicinity of Maarat al Numan. As a consequence it said the death toll was even higher, but that this could not be documented because “of extreme secrecy by concerned parties in the area“. 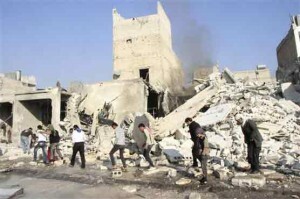 The Syrian Network for Human Rights published four early reports which blamed the Assad regime. But a detailed fifth report eventually said Russian warplanes were responsible, and that 67 people had died, including three women. The White Helmets – which needed two days to clear the site – said the final death toll was 96. 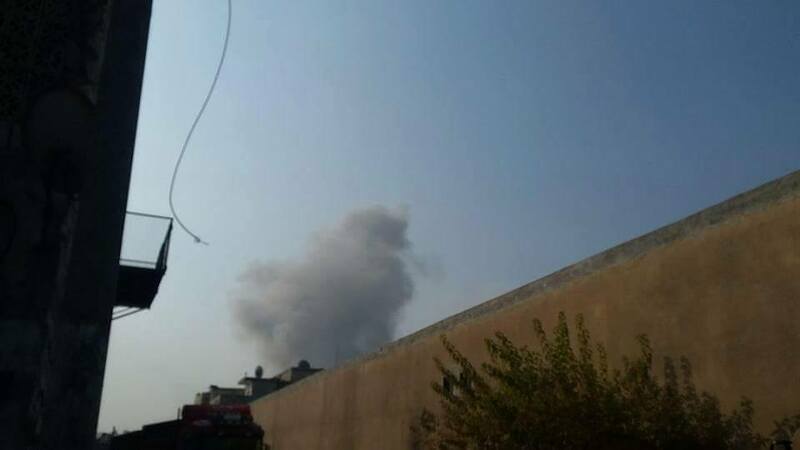 Between 61 and 90 civilians including two women and 11 children were killed – and between 40 and 100 others injured – in airstrikes on Khusham, according to multiple sources. While three of the five sources say that Russia was responsible for the attack, there was some uncertainty from the Syrian Network for Human Rights whether Russia or the regime were to blame. 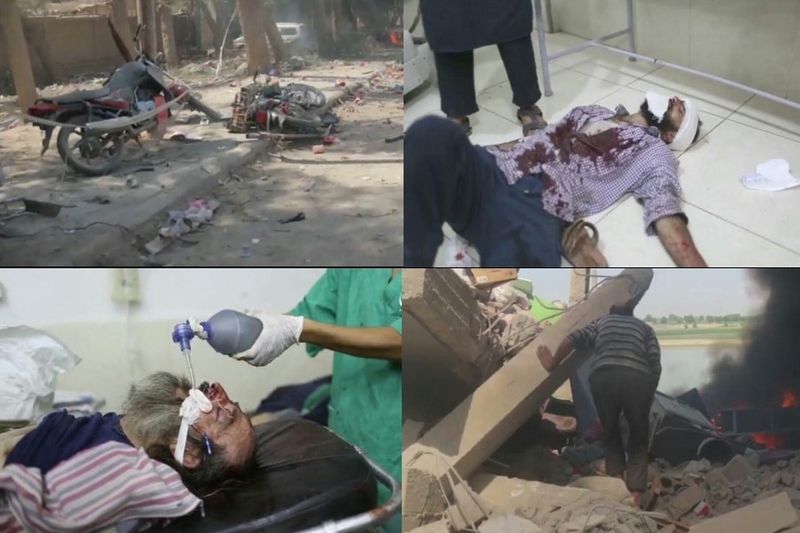 Deir Ezzor is Being Slaughtered Silently reported that Russian aircraft targeted the centre of the village of Khusham, near the “clinic of Sushi Mleihan“. They published eight reports in which they named some of those killed and documented the rising death toll, which they finally put at 90, with more than 100 wounded. The Shaam News Network also said that Russia carried out the raids, killing “at least 50 civilians” and injuring dozens more. They said that warplanes shelled several neighbourhoods, causing widespread destruction to civilian property including shops. 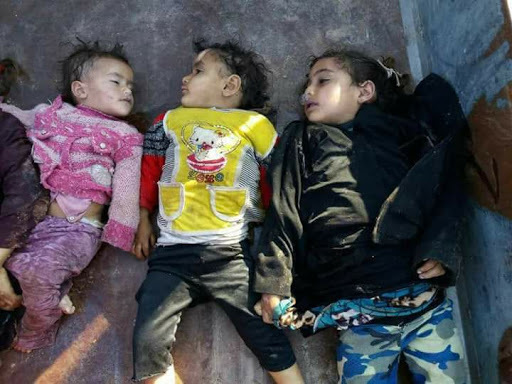 But a subsequent report by SNN – referring to a report by the Syrian Network for Human Rights – said that the death toll rose to at least 61 including 11 children and two women who were killed when “suspected Russian warplanes” fired four missiles. In confused reporting, the Syrian Network for Human Rights initially said Russian warplanes killed 61 and wounded nearly 40 others when four missiles were launched on Khusham. 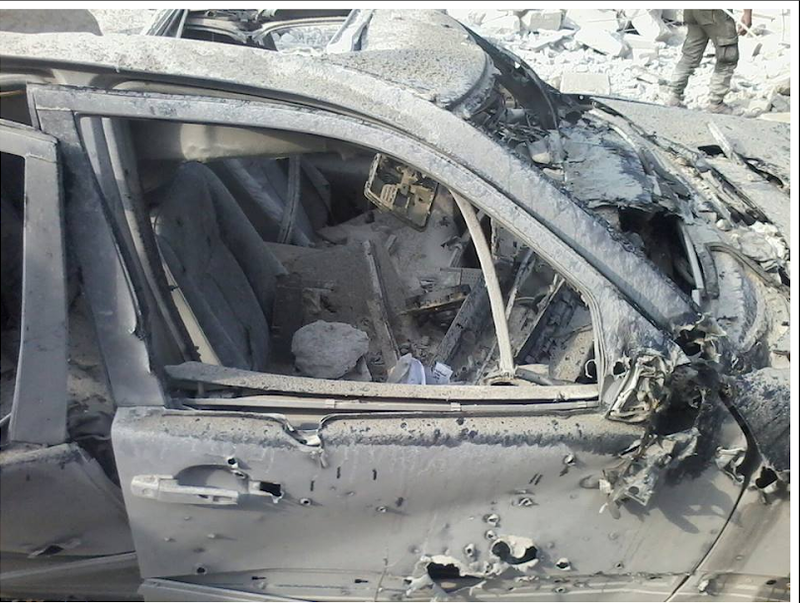 But two subsequent reports said it was not clear whether Russia or the Assad regime were responsible. 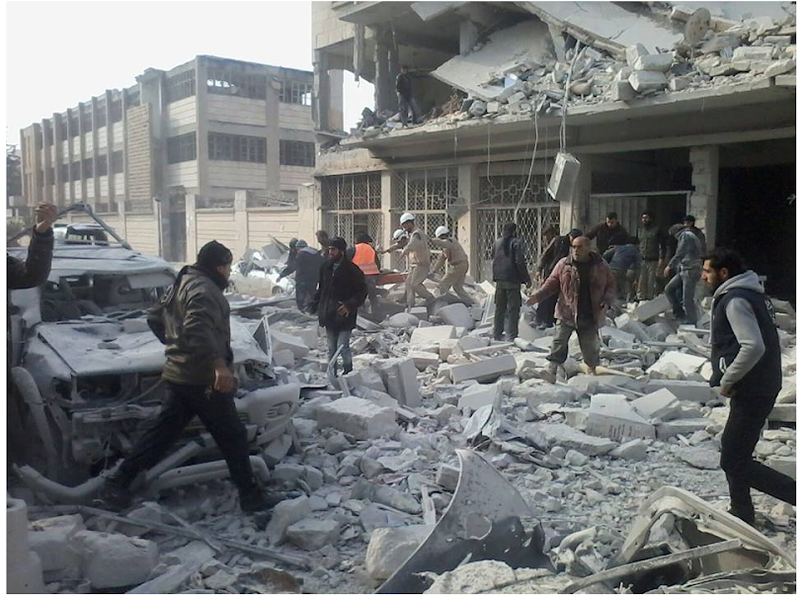 However, a final report on February 5 once more blamed Russia, again putting the death toll at 61. 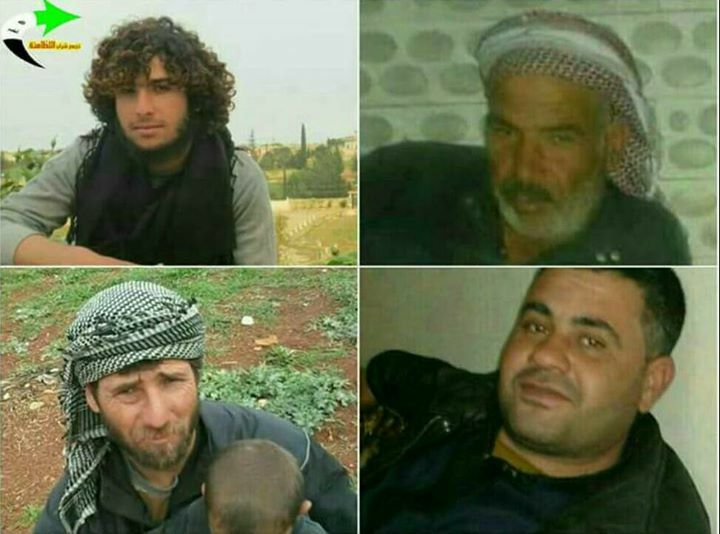 According to the Syrian Observatory for Human Rights, 33 non-combatants died, but the Observatory did not say who the “warplanes” belonged to.” They added that the death toll was likely to rise as many people were in a critical condition. 26 victims (killed “in a massacre due to Russian air forces shelling“) were named by the Violations Documentation Centre including one Unidentified male child. 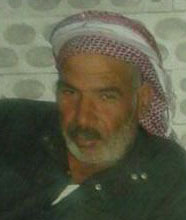 Deir Ezzor is Being Slaughtered Silently named another 41 victims, including 4 members of a refugee family from Homs. 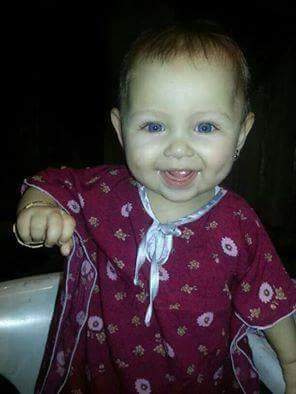 In a major casualty incident, up to 80 civilians including 29 children and 21 women died and up to 100 more were wounded in airstrikes on al Qouria town, according to local media. Reports said that entire families were wiped out, and Airwars has listed the names of 74 victims. It is currently unclear who was responsible for the event, which sources blaming both Russia and the Assad regime. The Syrian News Network quoted UNICEF and said “that there were reports of the deaths of 25 children in crowded areas in the town of Al-Quriyah in Deir ez-Zor air strikes”. According to The Syrian Human Rights Committee (SHRC) there were “several raids with cluster bombs, killing 72 people, including 25 children, and injuring dozens of others”. 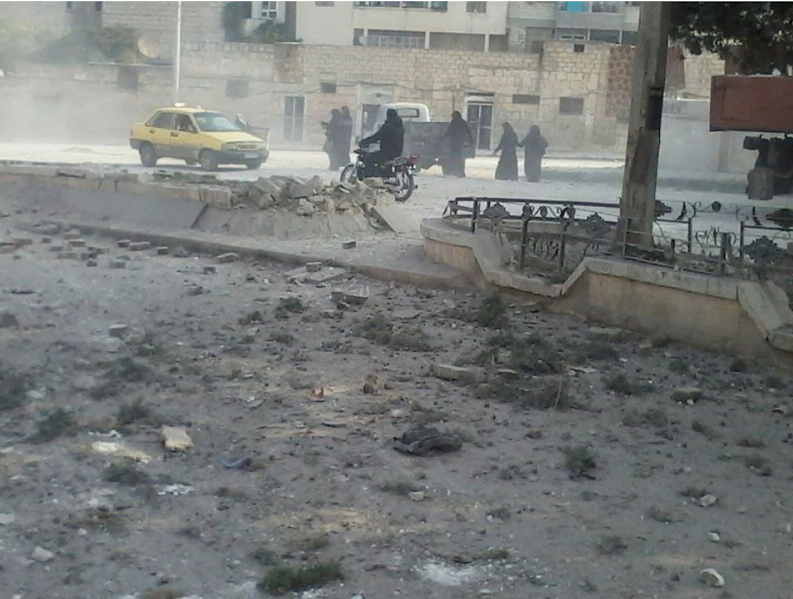 Similarly, a tweet from @salqin reported “more than 70 victims, mostly women and children”. 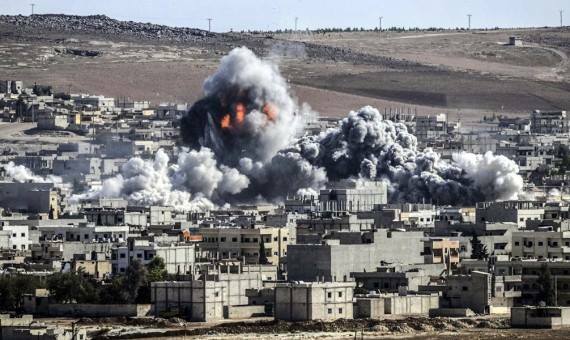 Sources said that the airstrikes targeted civilian residential areas and reportedly one mosque. It is contested who was responsible for the airstrikes, with sources pointing to both Russia and the Assad regime. 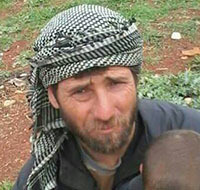 However, the majority of the sources – such as Syrian News Network, Syrian Network for Human Rights, Syrian Press Center, Jsirtv News and al-Arabiya – attributed the strikes to Russia, while only a few sources including Baladi News and Syrian Network for Human Rights, pointed to the Assad regime. A number of sources referenced the unlawful use of cluster munitions and phosphorous bombs. At least 19 civilians and as many as 80 – including children and women – were reported killed in alleged Russian airstrikes on Al Bab. According to al Jazeera – which placed the death toll as high as 80 with 200 injured – the attacks were carried out by helicopters, most likely Russian Hind-24 gunships. 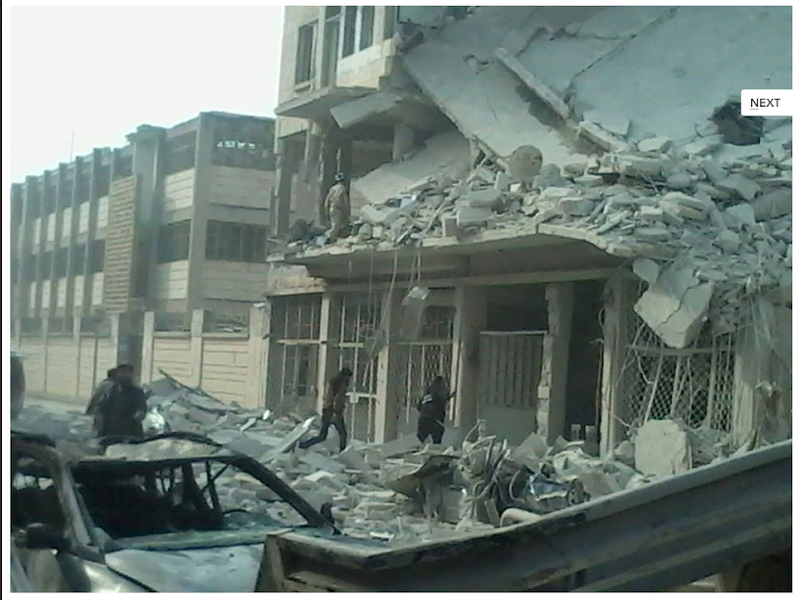 According to the Syrian Network, the town’s vegetable market was hit. Shaam Times placed the civilian death toll at 50. 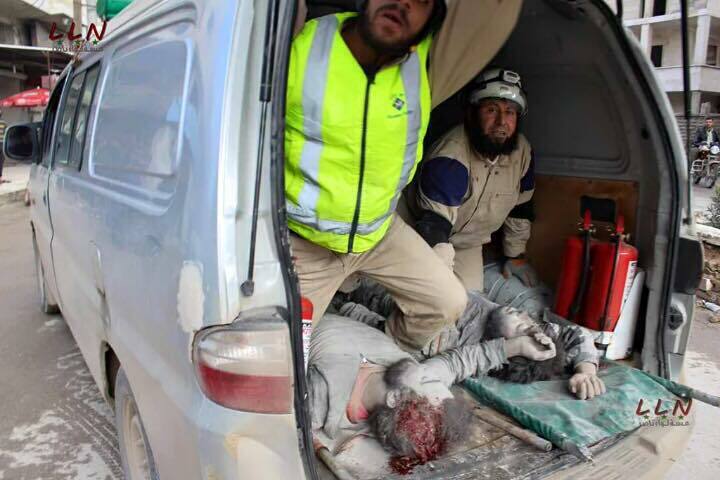 Between 43 and 73 civilians were reported killed and 70-170 injured in alleged Russian airstrikes on Idlib, according to multiple sources. 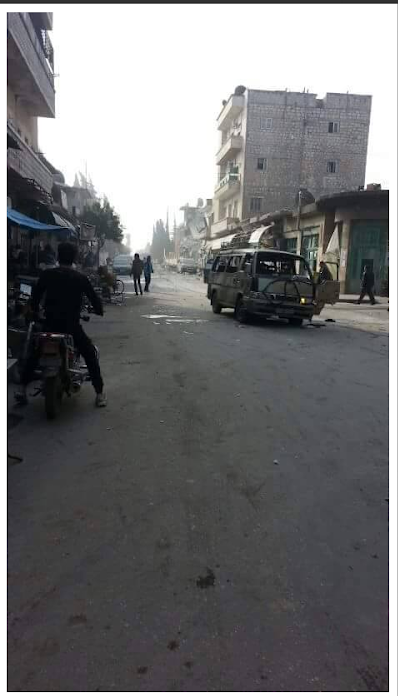 Al Jazeera posted a video from the main market on Al Jala’a street in which the reporter said 47 non-combatants were killed and 70 injured, in strikes by Russian warplanes. 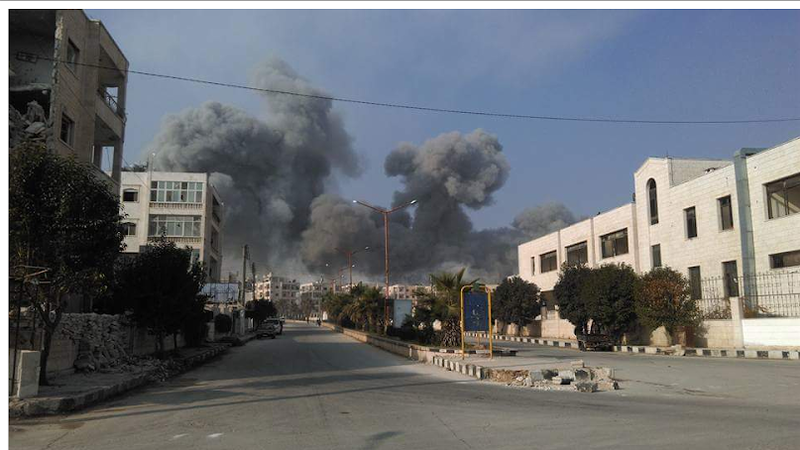 The correspondent said the street contained two schools, Al Ourouba school and a primary school, and that Russian planes were still circling the skies of idlib, despite a local truce agreed in the area. 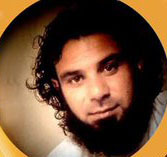 Al Jazeera English later posted a film by Nagieb Khaja which claimed the death toll had risen to 73. 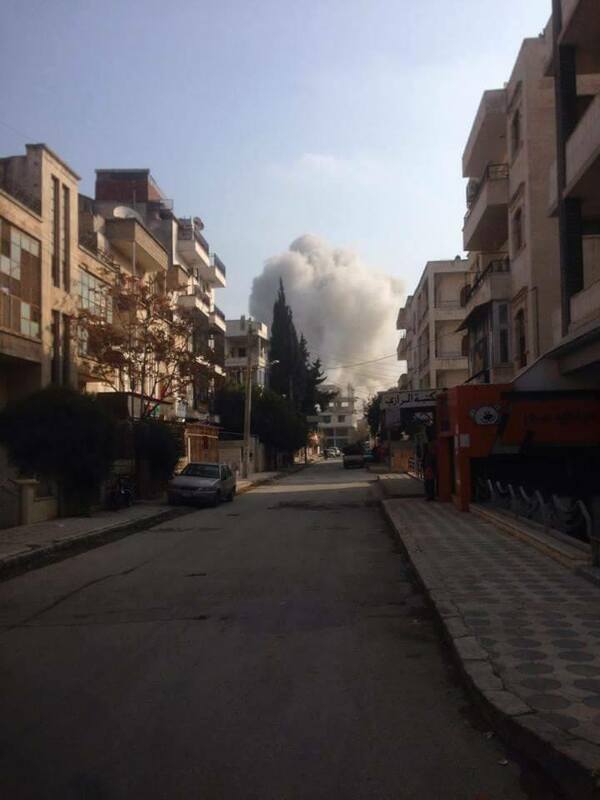 The Shaam News Network reported that Russian strikes targeted the Al Qoussour neighbourhood, the industrial area and the city centre. It initially said 50 died including women and children and that more than 170 were injured including critical cases, in six Russian raids targeting a party branch, residential buildings and the Department of School Books. 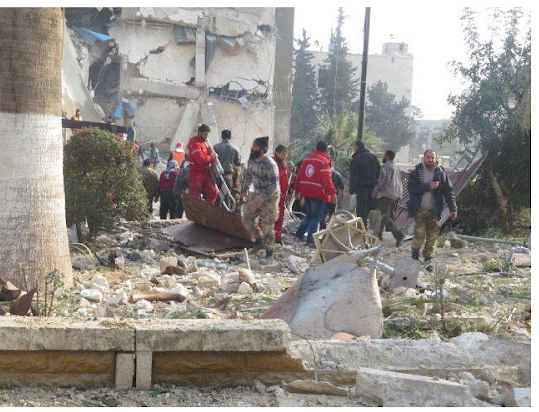 SNN added that there had been fears of repeated raids as the White Helmets attempted to evacuate the area and rescue bodies. A member of the White Helmets said the field hospital was full of casualties, that it had not been possible to identify them all, and that teams continued to search for survivors under the rubble. A subsequent report by SNN said that a Sharia court had also been struck, killing in total more than 95 people and leaving hundreds injured. 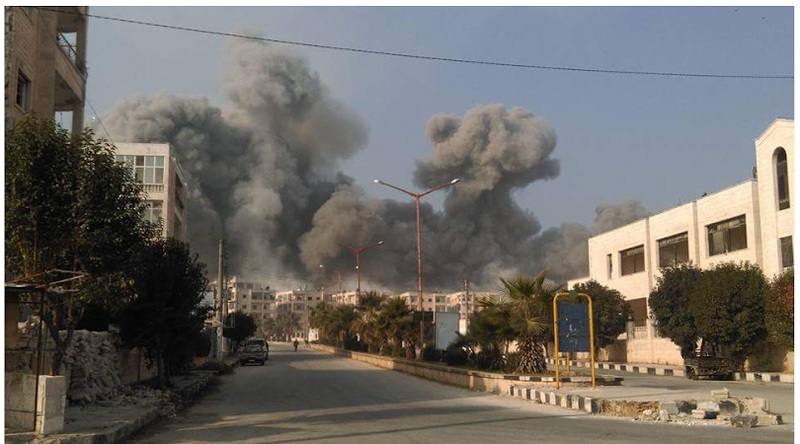 “ Three alleged Russian warplanes launched 6 airstrikes with 8 rockets on vital regions in the middle of Idlib city. The estimated region’s area is 1 Km2. 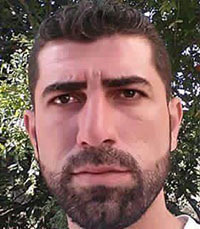 The Syrian Network for Human Rights kept one other name confidential due to search reasons – from Hama – a member of an armed opposition group.